I wanted to step out of my comfort zone and try using some colour combos that I'd normally avoid. 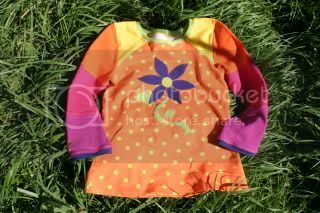 I also wanted to do something interesting on the front of the top - if I had an embroidery machine I would have used that, but I don't so I drew the daisy and appliqued it to the front. The colour combinations looks brilliant. I am sitting at the computer with my seventeen month old daughter and she was SO excited when she saw it. Pointing with glee.